Limited showers will be available after the race. We are very grateful to Kinvara GAA for the use of their facilities but please keep in mind that they are not equipped to cater for 1800 runners and hot water can not be guaranteed over a long period of time. Please keep the use of hot water to a minimum. If you have parked somewhere other than the GAA grounds but still want to have a shower after the race please walk rather than driving. There will still be people finishing their races and the turn off the main N-67 towards the showers is the busiest junction on the course, with participants having to cross the main road before heading back to the village. 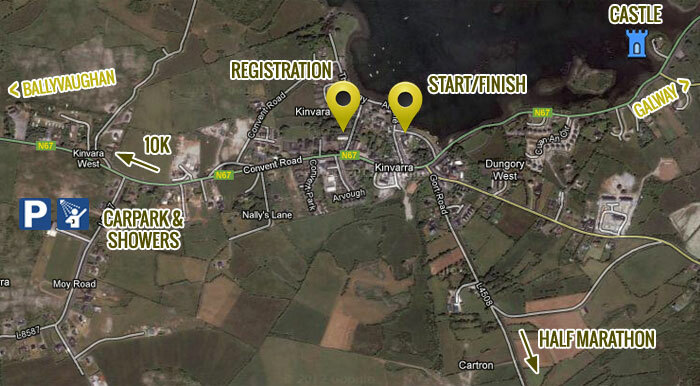 The walk from the start/finish area to the showers and car park is about 1K. A walk after the race will do you good too!